The role of the environmental artist should be to integrate the beauty of nature into the built environment, an effort to reconcile the works of man with those of nature. Toward this end, I work with architects, developers, and enlightened private clients to interweave these themes into our lives and buildings. Everyone benefits when given an aesthetic respite from the rigid geometry and concrete confines of conventional urban life. I provide many of the same services as a landscape architect, but from a somewhat different perspective. All of my designs are site specific, and to a large degree "site realized". 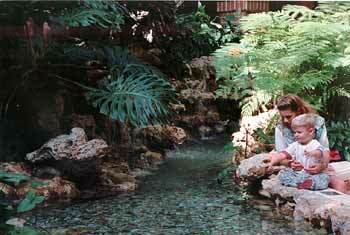 Fine art is never accomplished by the "paint by numbers" approach that typifies most landscape installation. All infrastructure and hardscape is placed in accordance with the design documents, but decisions as to the placement of individual stones, plants, and waterfall effects are made on site after careful consideration. This sculptural approach to landscape design insures the aesthetic excellence of the final product. The common thread in all of my work is an understanding of the beauty of nature, and the ability to incorporate it into an architectural setting. The goal is nothing less than to give the gleaming cities of tomorrow a wild green heart. 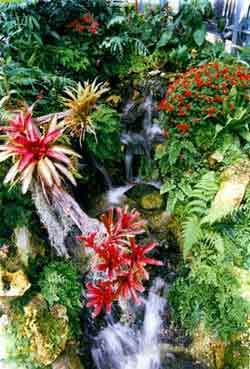 Looking down at the bromeliads and other epiphytes in this simulated rainforest ecosystem. 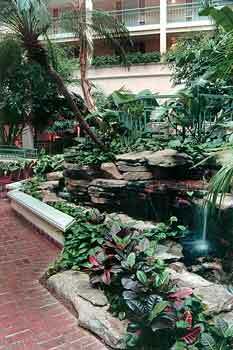 A view of the atrium hardscape and gardens, looking toward the lobby. 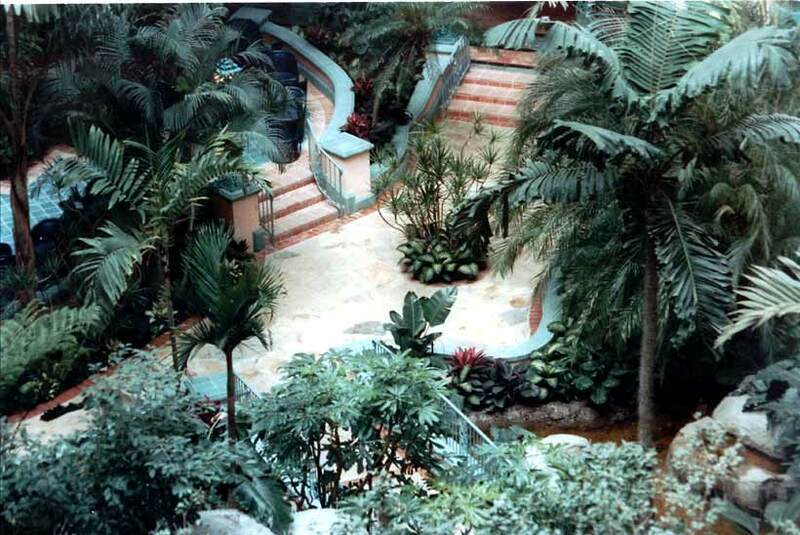 Lawyers may not approve, but it is impossible to keep people from exploring the hidden secrets of nature at the Ocean Terrace Inn.